Debbie Flowers plays with her great-nephew Simon Kenner and great-niece Melody Kenner. Debbie Flowers with her niece Kari Kenner, Nate Kenner and the Kenners' children, Melody and Simon. Debbie Flowers, left, of Burley is seen with her life-long friend Janet Hess Henry on July 8, 2018. Debbie Flowers, right, with her sisters, Joyce Merrill and Lois Pelton. An article published in the South Idaho Press depicts the crash that injured 17 Burley High School marching band students. This South Idaho Press photo shows a hospital worker tracking the conditions of students at the hospital on June 26, 1972, after a drunk driver plowed into the Burley High School marching band injuring 17 students. A South Idaho Press news clip shows the scene on the night of the crash. A South Idaho Press photo depicts a horrific scene from June 26, 1972, when a car ran into a group of Burley High School marching band students injuring Debbie Flowers and 16 others. BURLEY — A smart, vibrant woman loved by an entire community 46 years ago as she clung to life after a car plowed into the practicing Burley High School marching band has died. Lola Debra (Debbie) Flowers, 63, died Saturday at Parke View Care and Rehabilitation Center, where she made her home for many years. She never fully recovered from the crash that critically injured her and hurt 16 other students. The crash left her with vision, mobility and memory issues, her brother Jimmie Flowers said. 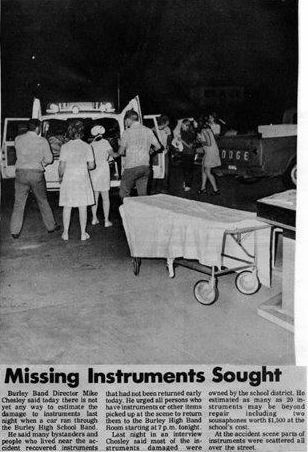 A clarinet player in the band, Debbie Flowers was 17 on June 26, 1972, the summer between her junior and senior years, when the crash occurred on a residential Burley street. The band and the Stepperettes were practicing on the road for an upcoming trip to the Calgary Stampede in Alberta, Canada, when Milo Hatt, also 17, drove his car into the group, leaving injured students and their instruments scattered on the road, according to Times-News and South Idaho Press articles. Hatt was later charged with driving under the influence and reckless driving, according to the paper. Hatt’s vehicle skidded hundreds of feet before hitting the students. Debbie was hit first. The impact broke her neck and injured her head. A doctor living in the neighborhood provided first aid to the students and probably saved Debbie’s life, her brother said. She was taken to a hospital — and was at one point pronounced dead — but she was later put on life support. Her family was told she had no brain activity. But when hospital staff removed the life support, Debbie continued to breathe. She remained in a coma for six months. Eventually, she woke, and Jimmie, 12 years older than his sister, remembers how he and his wife, Freida, helped Debbie learn to walk again in the living room. Debbie finished her senior year studies at home but was able to walk unassisted across the high school stage that spring to collect her diploma. The friends met when they were four or five and reconnected in junior high after attending different elementary schools. “(We) spent the rest of our lives as friends,” Henry said. Debbie was smart, played several instruments and was very religious, her brother said. Freida recalls how accomplished Debbie was at tap dancing and how she performed at her and Jimmie’s wedding. After the accident, the family rented a motorhome and took Debbie to Calgary because Debbie felt bad that she missed out on the band trip. She later attended three colleges. She also developed a life-long love for Tab soda, which over the years became increasingly difficult to find. “I still have a couple here for her; she liked it all her life,” Jimmie said. Other favorite treats were lemon poppy seed muffins and dark chocolate of any kind. Her most enjoyed meals consisted of cheeseburgers or pizza and occasionally she asked for a Dairy Queen Blizzard — any flavor, her brother said. She wasn’t fussy — whatever was on sale. “I’d smuggle as many goodies in to her as I could without the staff getting mad,” Jimmy said. She also loved to write letters to her friends and she had beautiful handwriting all of her life, he said. When her niece Lisa Clegg attended college, she always looked forward to Debbie’s letters because they were so colorful. Clegg remembers overnight stays with Debbie full of nail-painting parties and watching cartoons together the next morning. Debbie was also the secretary of the residents’ group at Park View. After her mother and sister passed away, Debbie appeared to give up some of the spark that had kept her pushing forward, Jimmie said. Debbie wanted to do so much with her life, Freida said, and it broke her heart that she couldn’t do all the things she wanted to do. These stories have been getting the most attention. What did you miss?